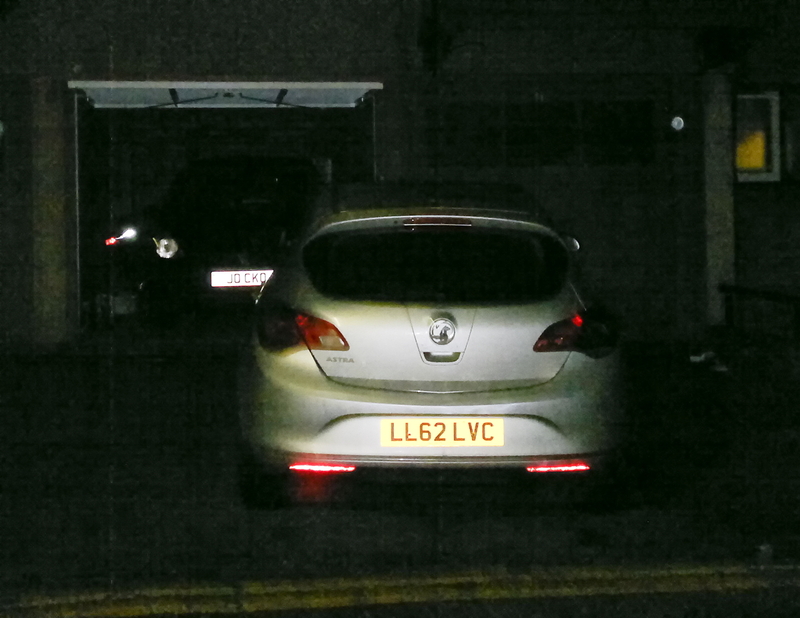 Came down to my garage at 06:15 today to find a car parked over my garage. Not just mine, but the one next door as well. I tried to squeeze past it, but the angle of his wheel did not give me enough room. My wife went off to work in a taxi (best part of £20) and I dialled 101. After about half an hour nobody had turned up so I called the police again and told them I was going to break a window and let the handbrake off. I was advised not to and told they were trying to contact the registered keeper. After about another half hour a WPC phoned to say the keeper was on his way to move it. A large brown man of Afghan appearance turned up shortly after, full of apologies, and shifted the car. I told him what would happen if he parked there again. I wonder if his radio will work with the roof aerial snipped off at its base? If this vehicle is on your land, without permission, does that not give you certain rights? Yolu could impound it for example, or charge exorbitant parking fees. In the old days, you could enlist the help of a few burly neighbours and bounce the thing into the middle of the road. Unfortunately you are likely to rip bodywork off now cars are so flimsy. I'm afraid he would have found it dragged into the road if was blocking my drive. It's a wonder the Police didn't tell you it was a civil matter. I am surprised you did not have to apologise to him for waking him up so early. Garages are council owned and not up a drive. Police in Scotland will get a vehicle shifted if you are trapped in your garage or drive, but will not shift one to let you in. Finding burly neighbours at 06:15 is easier said than done! Many years ago I worked with a guy who had a similar thing happen. Work was very busy and he went in on a Saturday morning for some overtime. He lived near a very popular market. On coming home there was a car parked on his drive, he thought that they had visitors, so parked his car behind it. You've guessed it. Someone who had gone to the market decided to park on his drive. Apparently the doorbell rang and someone asked if he could move his car. His reply, "no, sorry not moving it till I go to work on Monday morning". The car owner called the police. When they arrived the situation was explained. Of course the police could do nothing and the car owner had to get a taxi. When he returned home from work on Monday afternoon the car had gone. Hopefully with a well learned lesson. When he tries his radio he will realise he didn't just get an early call. Standing for an hour with a garage full of tools was just too tempting. You'll have to hope that he doesn't google his registration, and find your post, when he works out why his radio doesn't work. LL62LVC features in it's own YouTube video. A friend bought a Suzuki Grand Vitara, checking the vehicle data revealed that it had been on a personal plate. Googling the previous registration revealed a youtube video of the car from a cyclist's head cam - zooming past, nearly having him off. Someone did this to a mate of mine who towed/dragged it onto a busy crossroads and dumped it, chaos ensued and the car got impounded by police. Came out this morning to find another car parked across my garage. Almost the same position as last time. Luckily I managed to squeeze past. Left a note on his windscreen and cleaned any fingerprints of the glass with Cockpit Shine silicone spray. Well done that man I love it,I am sure the owner will appreciate your kindness?. I have found in the past a very large wad of steel wool and a big spud forcibly inserted up the offending exhaust does wonders and very inconvenient.